about our New Zealand Safaris - Free Range Red Stag and Himalayan Bull Tahr package. 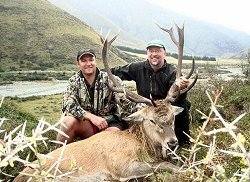 This hunt is based high among the Southern Alps of New Zealand with the picturesque hunting grounds directly out the door of your high alpine accommodations. A high degree of fitness is required for this style of hunting but the reward of completing this free-range hunt is great. This package is designed to be an all-inclusive door-to-door package from Los Angeles inclusive of your flights from LAX, all meals and drinks, guided hunting days as well as all trophy fees for a Free Range Red Stag and Himalayan Bull Tahr per hunter.